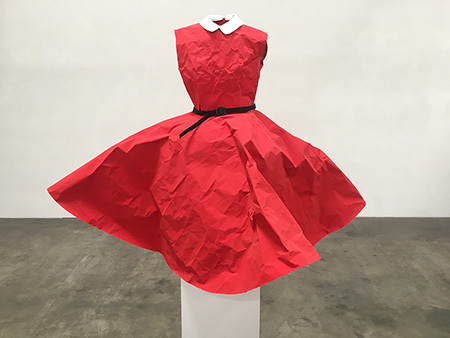 Phranc, "Red Dress (Please Don't Make Me Wear This Dress)," 2018, Kraft paper, thread, paint and cardboard, 36 x 42 x 37"
The bravado that comes across in Phranc's exhibition, titled and displaying “Swagger,” not only relates to a sense of self, but also the confidence that comes from mastery. Phranc's ability to craft objects from classroom materials — dresses, bathing suits and life jackets — is impressive and overwhelming. Best known as a musician or as she calls herself, “the All-American Jewish Lesbian Folksinger,” Phranc is also to be taken seriously as a visual artist with a long track record of creating everyday objects from simple materials. “Swagger” conveys a nautical theme. On one wall a series of orange paper life jackets’ white ties flow toward the floor. Though not identical to one another, each jacket is a numbered element in Phranc's "Survival Series." The life jackets refer to her "Lesbian-Feminist heroes who are fiercely surviving and thriving," and are as she states, "strong enough to float me in a world that wants me to drown." On another wall are three sailor hats made from Kraft paper painted white and carefully sewn to become a perfect replica. Banners spell out the words ‘Come Out’ and ‘Closet Case’ using the geometrical lettering from nautical flags. She adapts these international symbols, created for ships to signal each other, to communicate issues relating to homosexuality. Phranc is open about her butch lesbian identity. She speaks openly about her method of dress and self-presentation. It is easy to imagine the artist wearing the green shorts of “Tomboy Trunks” and the red “Chinese Lantern Shirt.” But it is difficult to envision her in frilly dresses like “Blue Dress” and “Red Dress (Please Don't make Me Wear This Dress).” These works stand in for uncomfortable moments of the artist’s childhood, when she was forced to wear such clothing. Phranc's paper clothing and objects made from Kraft paper, cardbaord and thread are ingeniously fabricated to replicate the original in exacting detail. However, the work speaks beyond aesthetics to more personal and universal themes. Phranc's paper shirts, jackets, hats, dresses and swim wear cannot be worn. While they are items culled from personal childhood memories, they are are also presented as symbols of strength, individuality and power. Phranc has remarked that her sewing machine is her weapon and her life jacket's are symbols that keep her afloat in a world that does not welcome her kind with open arms. One final work in the exhibition, located as one exits the gallery, is a paper ukulele titled “Popeye,” the instrument’s body sporting the image of Popeye the Sailor. Push a small button beside this object to hear Phranc's accompanying tune. Like Popeye, Phranc is a creator, problem solver and proud of her swagger.